Fiddling around with your iPhone, iPod touch, or iPad while driving or riding a bike is dangerous as it takes your eyes off an important task, which is why things like texting and driving are made illegal. Many of us use our iPhones and iPods in the car though for listening to podcasts and music though, particularly since AUX input is becoming a common feature of car stereos. So what are we supposed to do if we need to keep paying attention to the road (or whatever the important task is), but need to pause the music or audio? That’s where this handy trick comes into play. 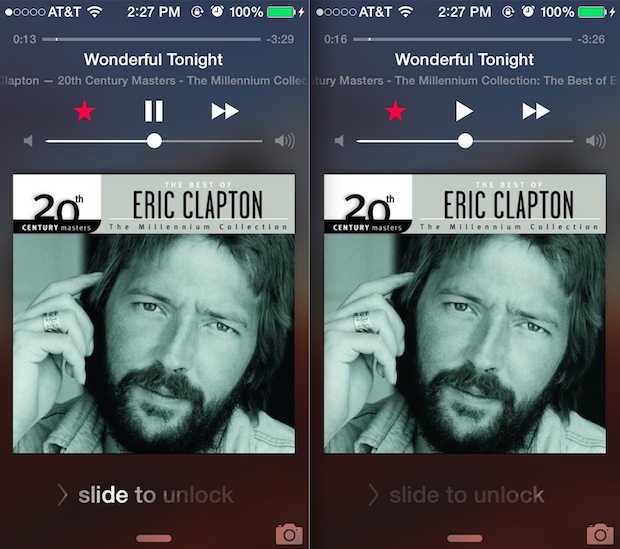 Rather than fish around with your finger to hopefully tap the “Pause” button in the Music app, Control Center, or Lock Screen of iOS, use this physical intervention instead: pull the audio cable out of the iPhone, iPod touch, or iPad to instantly pause whatever is playing, whether it’s a song, podcast, audiobook. Yanking out the audio or headphone cable instantly pauses anything playing, plus it is quick and easy and you can do it without looking at the device. It’s certainly much simpler and less distracting than looking for the onscreen button. Any AUX audio input/output cable behaves this way, as well as headphones and earbuds, just pull out the cord whatever it is. 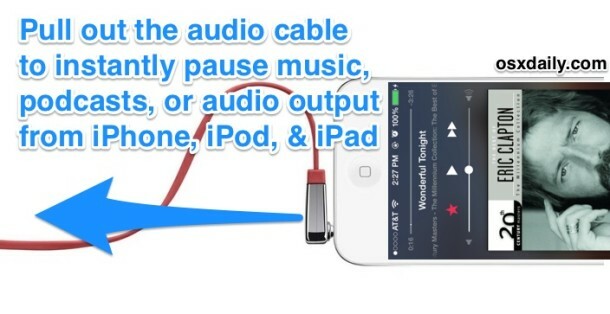 This works to pause anything, regardless of the audio source, whether it’s coming from Music app, YouTube, or any other app with audio output support. The only requirement for this to function is having a reasonably modern version of iOS, as the older versions didn’t support the feature – which led to a fair share of embarrassing moments I’m sure. Of course, for those who are going to do this while driving, some modern car stereo systems have a ‘pause’ button on the steering wheel which would also work, and some even have Siri which can also pause audio without looking, just request the music be paused. 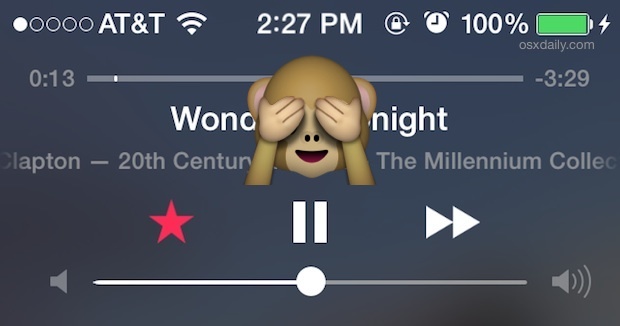 For those who use a dashboard mounted iPhone holder for directions or whatever else, it could theoretically be easy to tap on the pause button, but even then remember that you can always pause music by yanking the cord out too. Thanks to Nick for sending us the tip idea, and for those wondering, no this does not work the same on the Mac. Got any tricks you want to share? Let us know! I discovered this accidentally when tripping over an iPad connected to a stereo system. Oops! But yes, it pauses music, so that’s good, at least the airborne iPad was not playing music as it crashed into the wall, that would have been bad. But doesn’t one need two hands to put the cable back in again? Those clamp phone holders always work loose, and if you just have it on the passenger seat, you still need two hands. While sitting at a T intersection on Sunday, I watched in horror as a young girl maybe 20, texting while she sped through a red light, hitting a family of 4 while they were making a left turn. All 5 were killed instantly. The news story said the girl had previously been cited twice for texting while driving, and the cops estimate she was doing at least 60 MPH in a 35 MPH zone. She won’t text and drive anymore. That is absolutely tragic. Messing around with a phone while driving is just as dangerous if not more so than drunk driving, it should be illegal everywhere. Perhaps in the future phones will detect driving and not allow usage, or cars will sound an alarm, or something to help prevent disaster. While this could probably make it easier for you to stop/pause music from your iDevices, wouldn’t it be bad for the headphones? If you pull the headphones or cable out from the base it should be fine, that is where they were designed to be pulled out from. To plug it back in, just wait for a red light or when the car is stopped. Or in a fast food window. Of course, if you are listening with your Apple headset, you can pause (and restart) without looking by pressing the pause button on the headset. This is not very useful advice. Yes, yanking out the cable when driving will pause the audio, but you then can’t safely push it back in until you stop. For people who need to pause audio frequently e.g. if learning a language and needing to pause to try to remember translations before hearing the answer, this is not a solution. I’ve not yet found a good answer. If walking, you can use headphones with a cable switch, but I can’t recommend headphones while driving.